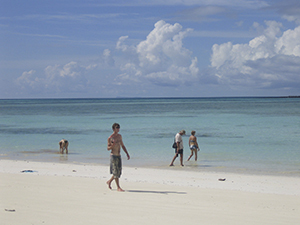 On our small-group Madagascar holiday you will see the striking east of Madagascar. Get in touch with the Indri, the largest of the lemur species, as well as brown lemurs and bamboo lemurs. Also explore the wonderful island paradise, Sainte Marie - the charming 57 km long island on the east shore of Madagascar. Our Madagascar East vacation is our insider tip, as it combines lemur sightings with beach relaxations – which are the two main highlights of any Madagascar vacation!. Departures: Every day of the week – subject to availability. 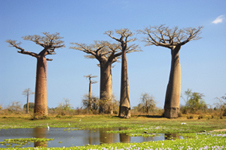 • 8-Day Private Lodge tour through the east of Madagascar. Andasibe National Park, Night walk, reptile farm in Marozevo, Palmarium Park, Sainte Marie Island, Antananarivo. You will be met at the airport and transferred directly to Andasibe through a landscape composed of rice paddies, waterfalls and scarce forest stations. Along our way we will stop at Marozevo to visit a reptile farm. Then we head to Andasibe, a small and pleasant village, former logging centre and home to one of the most visited National Parks of the island. Before dinner, we will go on a night walk in the area of Andasibe, where we will have the chance to see some nocturnal species of lemurs. Overnight: Hotel Grace Lodge, or similar. After breakfast, we will go on a morning visit of the reserve to see the Indri lemurs, the largest of the lemur species, as well as brown lemurs, bamboo lemurs, various birds, colourful chameleons and other fauna and flora Andasibe National Park is renowned for. Later we drive to Manambato, where you will go on a boat transfer to Akanin' ny Nofy, which means "Nest of Dreams". Overnight: Hotel Palmarium or similar. In the morning we will visit the private Palmarium Park, also known as Akanin' ny Nofy, which is situated on 50 ha on the east coast of Madagascar, along the Ampitabe lake and the Indian Ocean, in the Pangalanes Channel. 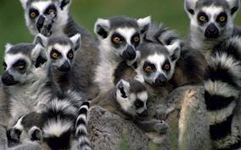 You will be able to discover the endemic flora and fauna of Madagascar, such as rare palm trees and plants like orchids and mahoganies, as well as reptiles and 10 different species of lemurs living in its trees. 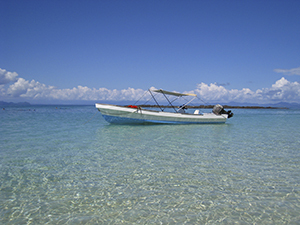 In the afternoon you will go on a boat transfer to Tamatave in the Pangalanes Channel. 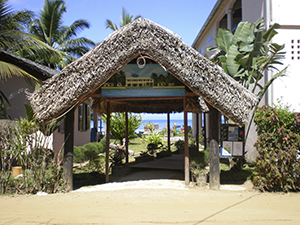 You will be collected at the port and transferred to your hotel in Tamatave, the major city on the east coast and the country's largest port. It is a pleasant place with long, wide avenues lined with flamboyants and palm trees, a seaside promenade and a good selection of restaurants. Overnight: Hotel Joffre or similar. Today you will be transferred to the airport for your flight to Sainte Marie, where you will be met and transferred to your hotel. The rest of the afternoon is at leisure to explore this wonderful island paradise, Sainte Marie - the charming 57 km-long island that lies 8 km off the coast of eastern Madagascar. The island offers long beaches, shallow seas, cascades, tropical flowers and almost Caribbean atmosphere and is also of interest for its several old buildings and its long history as a pirate haunt. This day is free at leisure and you have the opportunity to enjoy some of the numerous optional excursions available at your own expense. Go on a boat excursion to the small island "Ile aux Nattes", Sainte Marie's jewel with its beautiful beaches, bays and emerald lagoon; or visit the pirates' cemetery. For outdoor-lovers, the island is crossed with tracks and offers many opportunities to explore on foot. Enjoy the crystal clear waters of the Indian Ocean while snorkeling or scuba diving with one of the many operators on the island. 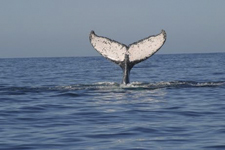 From July to October, you will have the chance to see the majestic humpback whales near the island. You will be transferred to the airport for your flight to Antananarivo, where you will be picked up at the airport and transferred to your hotel in the city. Antananarivo is the picturesque capital of Madagascar. With its bustling markets, friendly people and ancient town on a hill with freestone churches and ancient royal places, it is unique among the world's other capitals. You can wander through the capital's steep and narrow streets, taking in its architecture, atmosphere and pace. Or you can climb up to the old rova (palace) and enjoy the views over Antananarivo and the surrounding countryside. The town is at its best in the evening when the setting sun spectacularly illuminates its hillsides. Overnight: Residence Lapasoa or similar. Today you will be transferred to the airport for your flight back home, where your unforgettable tour ends. We hope to welcome you to Madagascar again very soon! 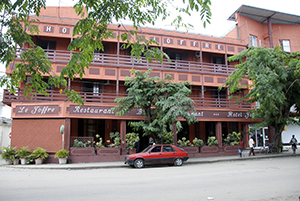 Accommodation based on BED & BREAKFAST basis at mid-range hotels, all transfers and transport mentioned in the program - including car transfer with an English-speaking driver* from Antananarivo to Manambato, all park and reserve entrance fees, service of local guide in Andasibe, all excursions mentioned in the program. *Please note that Malagasy drivers speak basic English and have general knowledge of history, culture and the fauna & flora in Madagascar. A supplement is payable should you require a specialist guide to accompany you on tour. English-speaking guide, international and domestic flights (Tamatave to Sainte Marie, and Sainte Marie to Antananarivo), airport taxes, bottled water, soft drinks and alcoholic beverages, laundry, visas and travel insurance, all lunches, all dinners, personal items and shopping, all excursions not mentioned in the programme. (Flights from/to Johannesburg and domestic flights can be arranged by Eyes on Africa). When arriving in Antananarivo in the morning of Day 1 of the tour you will be picked up from the airport and embark on your tour. Should you arrive prior to day 1, pre-tour accommodation can be arranged and you will be picked up from your hotel on the morning of day 1. (Pick up time will be confirmed on arrival). Accommodation will be in basic hotels. Please note that Madagascar is a country which is in its infancy when it comes to tourism. Accommodation is limited, so all the above mentioned accommodations are subject to availability and we reserve the right to change these using similar accommodation of the same standards. The hotels used are simple & clean and of basic standard. Madagascar is an island nation in the Indian Ocean, off the eastern coast of Africa. Madagascar is the 4th largest island in the world. 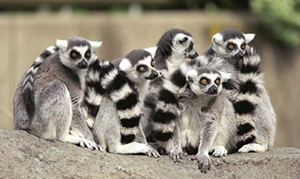 It is the home of five percent of the world's plant and animal species, 80 per cent of which are unique to Madagascar. Most famous among those are the lemurs. Madagascar and Mauritania are the only countries not to use a decimal currency. Its teeming fertile forests and geographical isolation have served to preserve and propagate 'nature's design laboratory' in a mix found nowhere else on earth. 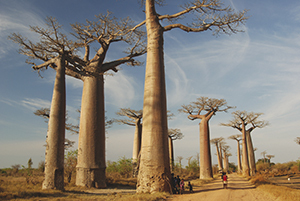 Madagascar's forests are a shimmering, seething mass of a-trillion stems and dripping leaves. Parc National d'Andasibe-Mantadia with its 12,810ha encompasses two distinct areas: the small Réserve Spéciale d'Analamazaotra (often referred to as Périnet, its colonial-era name, or simply as the Indri Reserve) in the south by Andasibe; and the much larger Parc National de Mantadia to the north. The park is easily accessed from Antananarivo and is a popular stop on tourist itineraries. The Réserve d'Analamazaotra - which is where most visitors come - gets crowded on weekends, but is usually much calmer during the week. It also tends to fill up during late July and August, Madagascar's tourist high season. Topographically, the area is characterised by low hills covered by degraded forest and dotted with a few small, attractive lakes. The best times to visit are from September to January, and in May. The Canal des Pangalanes was created in colonial times to provide a safe means of transport along the east coast. Today, it is used by local people in pirogues (dugout canoes), where for most of the community it is the only means of transport, especially in the wet season. The canal is a vital source of livelihood for fishing, & the water feeds the fields of cassava lining the banks of the canal. Along your journey, you will see many local fishermen checking their fish traps, as well as children playing in the water & women doing their washing. Ile St. Marie is known for its beautiful white sand beaches and coral reefs. Its dense vegetation and the difficulty of navigating the lagoons which surround it, made it an ideal base for pirates and, later a colony for convicts. Today the island is a vacation paradise. It has the world's only pirates' cemetery and visitors can walk among cashew and cinnamon trees, snorkel from the offshore islet or dive from one of the beautiful sandbanks. 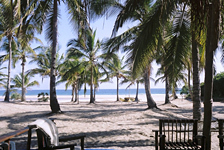 The island is less touristy than other resort islands off Madagascar, making it an ideal location to relax and enjoy the sunshine. From July to September, humpback whales can be seen playing in the ocean and breeching out of the sea in the narrow canal that separates the island from the mainland. They can be seen everywhere from the island but it is best to take a whale watching cruise and get an up-close look at these magnificent grey giants.